This is a time of year, even if you take every precaution to stay healthy, you often end up catching a cold from somewhere. I couldn’t escape the dreaded fate and went down with a cold the other day. However, as soon as I felt under the weather, I took it easy, thus it didn’t develop into a fully fledged cold. Anyway, when you’ve gone down with a cold or flu, you need to take a good dose of Vitamin C and, more than anything, take plenty of rest! Also make sure to take enough fluid. For me, the best home remedy for cold is Ginger, Lemon and Honey Tea! 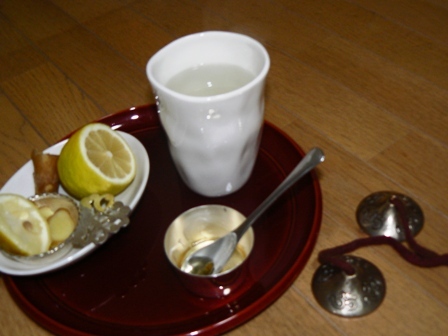 It is a hot drink made from fresh ginger root, lemon juice and honey as the name implies. What is so special about this tea? Well, first of all, ginger has a warming property and also it is known to help the immune system. As you know, lemon is high in Vitamin C and it is also full of Phytonutrients. Phytonutrients are plant-derived essential nutrients scientifically confirmed as important to human health. They help boost the immune system and much more. Honey has been used by humans to treat a variety of ailments for centuries. Its antiseptic and antibacterial properties as well as its positive effects to health have been well documented. In short, all three ingredients promote good health and they are especially great for boosting the immune system! You now understand this tea’s potency against cold, right? The icing on the cake is that it tastes utterly delicious and very soothing! How to prepare the tea is very simple! Just grate about a 1cm piece of fresh ginger root. Boil it together with one cup of water for about 10 minutes or so. Then squeeze the juice from half a small lemon and add a couple of spoonfuls of honey into the mixture. Strain into a cup and serve immediately. Please adjust the amount of each ingredient to suit your taste!